The NSKK is the Church in communion with the See of Canterbury in England and freely recognize the Archbishop of Canterbury as the Principal Archbishop and the focus of unity within the communion. These Churches are called the Anglican Communion. As a worldwide family of churches, the Anglican Communion has more than 70 million adherents in 38 provinces spreading across 161 countries. Its mission in Japan started in 1859 with the Rev. C. M. Williams from The Episcopal Church in the USA. The NSKK , which was established in 1887, now has 11 dioceses and approximately 300 churches with related schools, hospitals and welfare institutions, such as Rikkyo(St.Paul’s) University and St.Luke's International Hospital. 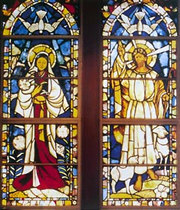 Kobe Diocese has 28 churches and their related schools, such as Kobe Shoin Women's University, Senior and Junior High School and Kobe Kokusai(St.Michael’s)University, Senior High School as well as St. Michael's International School. In 1881, a British missionary, The Rev. H. J. Foss ( the first Bishop of Kobe Diocese and the founder of Shoin Women's University) laid the cornerstone for St.Michael's Church. The Very Rev. Michael H. Yashiro served for 40 years, as the Rector and the Dean. During this time he was consecrated and enthroned as the third Bishop of Kobe and later the Primate of the NSKK. St. Michael's Church was burned down in 1891, and was rebuilt; but unfortunately it was destroyed by a bomb in 1945. St. Michael Church became the Cathedral of Kobe Diocese. 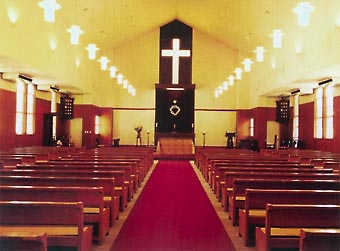 It was built on the present site and was consecrated in 1959 by the Most Rev and Rt. Hon J. Fisher, the 99th Archbishop of Canterbury, who was visiting Japan for the 100th anniversary of the NSKK. This cathedral has had the privilege of consecutive visits by three Archbishops of Canterbury: the 100th Archbishop M. Ramsey, the 101st Archbishop R. Cogan and the 102nd Archbishop R. Runcie.